As news and images of the Burmese military’s attacks on the minority Muslim Rohingya community spread around the world, partner, Bushra Qadeem Hyder, a school principal and long time educationalist in Pakistan was among the first to see the impact on the students around her. 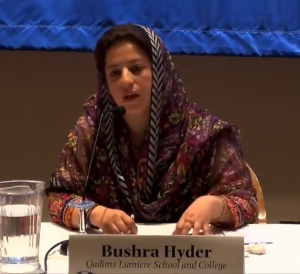 Hyder, with the help of her students who have been studying under her peace education curricula for years, hurriedly arranged a meeting with the parents of the boys who wanted to go fight. The next morning, they were with her and were similarly shocked to hear about their children’s intentions. Hyder explains that, “This is usually the case; the religious teachers have too much influence over the boys who hide things from their parents. By the time the parents realize, the damage is already done. They send their children to learn about their religion, not to become jihadists. The realization is always painful for them.” In this case the parents asked Hyder to speak to their boys. The following day, the boys met Hyder. Just 15 and 16 year-olds, they were adamant about their call to duty to save their Muslim brothers. It took hours of discussions, with the boys repeating the same rhetoric: Muslims are being persecuted, the situation is intolerable, and it is their duty to fight for Islam. Hyder reasoned with the boys, telling them that “Yes, it is an important issue, but there are many other things going on in our country of equal importance.” She went on to ask them whether they had ever helped someone in need in their own country, ever been to a hospital to help the sick, ever contributed to alleviate any pain for fellow Pakistanis. Their answer was “No”. She, then, asked “How come you want to go to a foreign land just to get killed in the name of jihad while there are so many people suffering in your own country?” The boys were confused. On the one hand, their religious teacher was pushing them for jihad making a strong point, while Bushra was giving a completely different viewpoint on jihad. They left, with confusion still apparent in their eyes. Hyder’s peace-educated students played a pivotal role in the days that followed. They remained close to the want-to-be-fighter boys and had long conversations with them, while their parents stopped them from going to the mosque. Eventually the boys went back to see Hyder. Their second meeting was different. This time they came to truly listen, and Hyder went through the different stages of Jihad in Islam, using examples from the Prophet’s life, and verses from the Quran. Making the point that “if you go, you will be killed, but if you stay, live and do good work, that would be more beneficial to Islam. That is true jihad.” Finally, Hyder and her students succeeded and the boys were saved. Examples of the immediate and long term effects of peace education are numerous but governments are not willing to listen. So the work is left to individuals who care enough. “We discuss everything with these boys. At their age, they have many questions and we try to answer them all. We build their capacity for analytical thinking and for reasoning so that they can deal with the situations they are put in. We discussed the Rohingya crisis at length, and this has helped them to hold discussions with other boys and dissuade them from answering the call to fight,” Hyder says. Hyder is still trying to work with members of parliament to take the peace education curricula nation-wide but it is a challenging endeavor. On both sides, the government and the religious schools (madrasas), there is fear of the words “peace” and “inter-faith dialogues”. The minds are set and they are hard to change – far harder than those of the teenagers. Echoing the analysis of ICAN/WASL’ report on Education, Identity and Rising Extremism, Hyder spoke of the dichotomy of politics and education. “Education,” she says, “should have nothing to do with politics, yet everything has become politicized. And religious institutions and movements are using education to further their political agendas.” It is difficult work, but she will not give up, “In my own generation this level of extreme religious influence did not exist in our schools. We lived in harmony with our neighbors regardless of their ethnicity or sect or religion,” says Hyder. “Today we need peace education to push back the influences that teach intolerance and advocate violent jihad at every turn”. And so she continues her efforts to convince the government, because the alternative trajectory is untenable and unfathomable.